In this episode, we welcome back author Gary Collins. 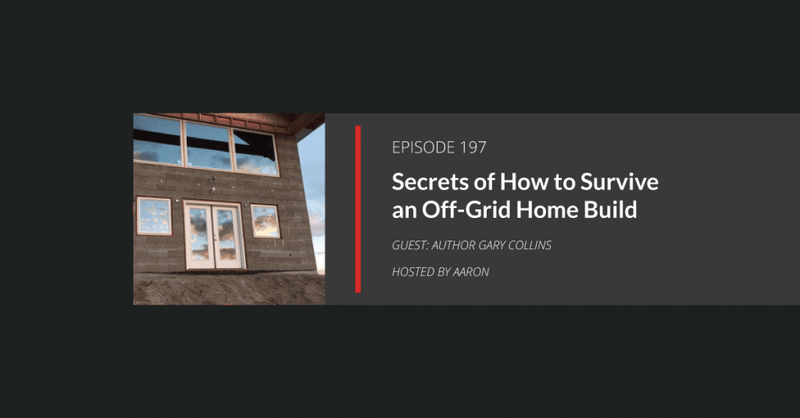 He’s going to share with us his experience with building an off-grid home. It’s doable, but it’s not all rainbows and kittens. Plus, he shares his patent-pending tiny house rant at no extra charge. Off-grid Home projects are fraught with pitfalls. Issues range from finding the perfect property to the construction itself. Then there’s getting electricity to your remote location. Unfortunately, no one makes it easy and those looking to go off the grid are left in the cold. But your buddy Gary is here to shed some light on the dos, don’ts, and how-tos. You see, he’s nearly completed the process and built himself an off-grid home in the mountains. And the process has made him a wealth of knowledge on the subject. So in this episode, author Gary Collins shares his experience and saves you some heartache and maybe your budget.